Bits of Tide plus some other stuff. As the latest first-round corner, Dre Kirkpatrick, has been finding out in his early sessions with Newman. “I never met a rookie that didn’t come in eager to learn. He’s going to fit into the mold of the rest of the corners I’ve known that have come in and learned from the older guys,” Newman said. No question, he’s been impressed of the 6-2 Kirkpatrick. It will be interesting to see if Dre winds up at safety or corner for the Bengals. It’ll also be interesting to see how Dre meshes with the Cincinnati culture. Former Alabama cornerback Dre Kirkpatrick was arrested early Tuesday morning in Palmetto, Fla., and charged with possession of a small amount of marijuana. The arrest came less than five days after Kirkpatrick announced that he would skip his senior season with the Crimson Tide and declare for the 2012 NFL draft. He was expected to be picked early in the first round. Kirkpatrick, 22, was a passenger in a rented vehicle driven by Chris Rogers, 25, a former Alabama defensive back. The vehicle was stopped by a Palmetto Police Department officer because it was being driven on the wrong side of the road, according to Manatee County Sheriff’s Department spokesman Dave Bristow. Rogers also was arrested for marijuana possession. The charge is a misdemeanor. The amount of marijuana that was found in the vehicle was 7.9 grams (0.28 ounces), according to the incident report. Kirkpatrick and Rogers each was released on a $120 bond, and court dates were set for Feb. 21. The arrest occurred at 12:39 a.m. Tuesday at 900 6th St. West in Palmetto, a neighboring city of Bradenton. Rogers admitted to purchasing the marijuana, according to the incident report. Kirkpatrick admitted to being in the vehicle when the purchase was made but said he did not know at the time that drugs were being purchased. Both men were under the influence of drugs at the time of the arrest, according to the incident report. Of course, both men are innocent until proven guilty. I’m sure Honey Badger just wants to move on, but not sure how good his memory is of this play. …you’ll hear Kirkpatrick’s name a lot before the draft. He’s likely the top cornerback on the board for most teams, given his size, athleticism, competitiveness and the fact he has played inNick Saban’s defense. NFL people like Saban’s players because Alabama does so many things in coverage that NFL teams do, and those players come into the league ready to go. 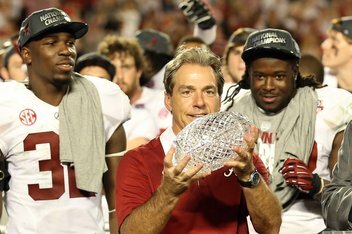 Saban’s practice approach is also cited by his former players as having prepared them for their professional careers. If Kirkpatrick runs well in predraft workouts and gets into the 4.3s in his 40, he could certainly be a top-five to top-eight pick. He’s already top-10 for many teams at this early stage, so the Broncos will have to finish with one of the worst records in the league to have a shot at him. The Broncos have three starting defensive backs who are over 30 years old, including both cornerbacks, so the position will get a long look with one of their first three picks. Wow. I’m not sure what Dre’s 40 time is, but it looks like he’s about to make some cash. Can McCarron Drive the Nuss Bus? How Far Will the Defense Drop?